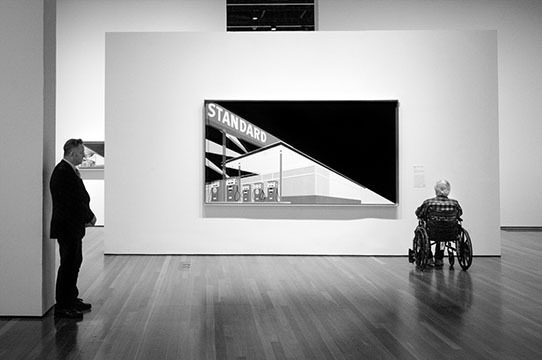 A series of digital photographs that Professor Emeritus Eli Hollander has collected from museums around the United States. The images show people relating to each other and people relating to the art or themselves. The environment becomes a character in the story. Hollander captures many quiet, decisive moments. Pictures at an Exhibition is inspired by the musical work of that name by Russian composer Modest Mussorgsky. It is a collection of images from several exhibitions in the Bay Area, Chicago, Washington D.C., and New York City since 2014. Hollander said, “the camera in a museum makes me experience art in a very different way and I find connections with the people interacting in the composition." Eli Hollander is Professor Emeritus of UCSC's Film and Digital Media Department. In 1974, he came to Santa Cruz as a founding member of the Film and Digital Media Department. He served as acting provost of Porter College, then called College V, from 1980–81 and was chair of Aesthetic Studies from 1977–1980. He retired in 2013. He no longer makes films and prefers seeking moments of order in modern chaos through his still photography. Parking permits required; available for purchase on site for reception event. Limited metered parking is available at Porter College.